I recently purchased a Kahr P9 and have would like to share my experience thus far with Kahr and their gun. The Llama was an interesting little gun being set up like a miniature 1911 Government Model. It is certainly cute, but I wasn’t comfortable with fit and finish and the price indicated a lower quality gun than I was interested in. Besides that, it was awfully heavy for such a small gun. The Sig P232 is a jewel of manufacture and finish. The stainless version was tempting (I have already owned a P232 in blue finish). What finally turned me off was the weight of the gun. Being of all-steel construction it is heavy for a small pistol. The Kahr was lightweight, well-made and 9mm. A better load than .380, and inexpensive ammo to boot. I received a call from Larry Meyers at Kahr a couple of days later. Larry stated that he had inspected and test-fired the gun and was confident that the defect was not a crack, but rather a scratch caused during assembly. I accepted the explanation but told him that I paid $57.00 for shipping and insurance and felt that Kahr should help me out with the cost. No problem. Larry and I struck a deal whereby Kahr would install a set of MeproLight sights and deduct my shipping expenses from the price of the sights and installation. I got my gun back the next day. Sights installed, old sights returned and the scratch buffed out of the frame. Great service! I took the gun to the local range to work it out. Kahr recommends a break-in period of 200 rounds of ball ammo before attempting to use JHP ammo. I cheated.. I put 100 rounds of CCI Blazer through the gun then ran 4 magazine loads of Miwall JHP ammo without any malfunctions. The gun was surprisingly accurate and the DAO trigger was smooth and easy to control. Much better than the Austrian guns that I own, lacking the trigger take-up and stageiness of the Austrian pistols. 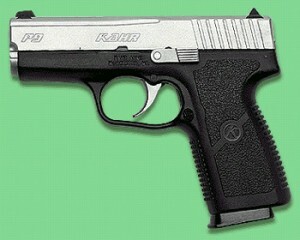 The Kahr P9 is lightweight, being of polymer frame with a stainless steel slide. The gun is slim and in my opinion quite attractive. Recoil when shooting wasn’t uncomfortable at all. I like this gun. I would recommend it to anyone who likes a lightweight pistol that packs a 9mm punch.